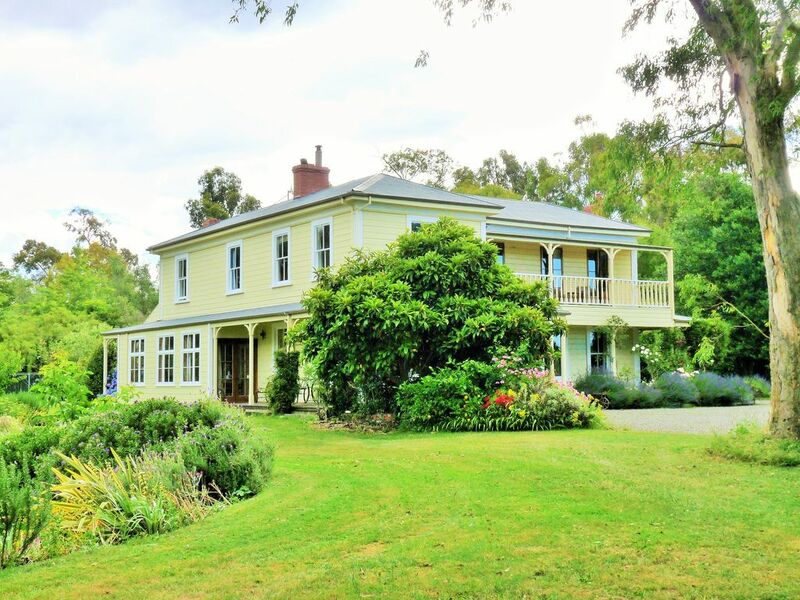 Located in the heart of New Zealand's premier wine district, this beautiful Historic Homestead, overlooking a vineyard, is exclusively yours to enjoy. Hawkesbury was built in 1883 and has been tastefully restored. Set on 13 private acres, in a quiet valley neighbouring the famous Marlborough wine trail and cycle route, Hawkesbury is one of the oldest character Homesteads in Marlborough. The history of the property and park like grounds with century old trees, create a timeless romantic setting from a bygone era. Ideal for just a couple or as a luxury recreational retreat for an entire family or group. It is complete with its' own private swimming pool, full size tennis court and bicycles. Located in a peaceful rural valley, you are ideally situated to explore the upper half of the South Island. You are only 5 minutes from a small market town (Renwick), 15 minutes from Blenheim, (Marlboroughs main centre), 30 minutes from Picton and the beautiful Marlborough Sounds. To the South is Kaikoura, with world class whale watching and swimming with the dolphins, to the west you are 90 minutes from the arts and crafts of Nelson, southwest is the high country and trout fishing in the Lakes. The airport is only 8 minutes away and there are many daily direct/short flights to Wellington, Auckland and Christchurch. This Historic Homestead, with its full facilities and surrounding acreage ensures a long lasting memory of peace, privacy and timeless tranquility. The Homestead was originally built by Cyrus Goulter in 1883. His son Charles raised a large family at Hawkesbury and was famous for breeding Merino sheep. The property remained in the Goulter family for over a hundred years. My husband and I bought the property many years ago and have extensively renovated it so that it is now back to a lovely country casual style. We love to travel, enjoy adventure and hospitality, and take real delight in having guests from all over the world enjoy Hawkesbury. This is an unique opportunity to experience the peace, tranquility and timelessness of a Historic Homestead. A setting that includes century old trees in park like grounds that are exclusively yours to enjoy with beautiful views of mountains and vineyards. Sole use of swimming pool and tennis court. Watch cattle roaming freely over several of the acres. The local farmers graze sheep, cattle and deer, which you see as you drive, walk or bike up Hawkesbury Road. The Valley has several wineries and a large number of vineyards. From the Homestead you look out over the Hawkesbury valley, with its vineyards and pastures, to the Richmond Mountain Range is in the distance. There is a generously stocked pantry for your convenience. We ask guests to replace items used. Generously stocked full country kitchen with all kitchen equipment supplied. Large table that seats 10 to 12 people. Plus outside grill with large circular table on the verandah overlooking the pool. Nearest 18 hole golf course is 5 minutes away. Homestead, quiet, beautiful gardens, very comfortable. Appliances a little old, but this did not detract from the overall fantastic holiday experience. We highly recommend for a group getaway in the beautiful Marlborough region. You won’t be disappointed as my wife wasn’t! Owners lovely! It was a pleasure having you and the family at Hawkesbury for 10 days. It gives us great delight to have people enjoy and experience the Historic Homestead, and her extensive grounds and gardens, in a way that gives them a relaxing and enjoyable holiday. My wife and I stayed at this unique property for four nights in mid-Jan 2018. Hawkesbury Homestead's curb presence is outstanding; it's a beautiful looking home in an idyllic setting with large trees, flowers everywhere, and a vineyard just past the adjoining pasture. The owners are both very engaging and friendly and we enjoyed a glass of their own sauvignon blanc and some cheeses with them right after we arrived. There's a saltwater pool and a tennis court too. Just walking the grounds was very relaxing and my wife and I very much enjoyed sitting on the one of the many decks and just watching the world go by. The house is close to many cellar doors who are more than happy to have a visitor, and we spent a day riding the Hawkesbury Homestead bikes to various wineries. There are few what I would call indrastructure issues however. First, the beds are just queen sized. My wife and I haven't slept on a queen sized mattress in 20 years and the smaller size took a little getting used to. There is no air conditioning either and only one door and one small window has a screen, meaning bugs will come in, especially if you leave a window open and have a light on at night. It is an old house (built in 1883), and these are some of the issues that our ancestors faced. But this house seems to be pretty well insulated, and we found that we could capture the morning coolness all day and night. The kitchen works just fine and we grilled some lamb, sausages and pork over three nights after we acquired these items at the local farmers' market. There are tons of things to do nearby too and we found that we ran out of time to get to everything we wanted to see and try. Looking back I would give our entire Marlborough area experience five stars. We very much enjoyed staying at Hawkesbury Homestead too. My wife and I have rented many homes around the world and found this one to have a very unique personality. This house makes a perfect base for a family or group of friends. It is very comfortably furnished with many elegant details. Bedrooms are luxurious and beds are terrific. Very nice bathrooms. The Kitchen is huge and well-equipped, and very clean.Gardens are fabulous and well-cared-for. Swimming pool and tennis court add entertainment possibilities. If you can tear yourself away from the house, surrounding countryside holds some of the best-known vineyards in New Zealand. Owner is very helpful and insightful guide to the area, and delightful company to boot! My family and I spent Christmas week here and will never forget the fabulous time we had. I would definitely recommend it to any group seeking peace and quiet in the heart of wine country. This was our favorite place we stayed on out trip to New Zealand. The house was a wonderful historic building smack in the middle of wine country! All modern amenities, lots of things to help keep you busy, like tennis, swimming and bike riding offered on site. The owners are THE most welcoming people and we felt right at home in this cozy setting. My mom was visiting from the US, so I decided to surprise her by renting the homestead for just the 2 of us. She loves old homes/antiques, so she was quite excited. We each had a floor to ourselves and enjoyed the pool and the bikes. A tennis court is also available. The location was ideal for day trips to Picton, Havelock and the Queen Charlotte Track. Lynda was wonderful to work with and was available if needed. Highly recommend the homestead in wine country! Our family (parents plus 2 adult children and husbands) spent Christmas at Hawkesbury Homestead. We were looking for something special and were not disappointed in anyway; the Homestead, the location and the welcome and hospitality shown by Lynda & Charlie was all outstanding. Hawkesbury is beautiful, it has a wonderful homely feel where we all felt instantly comfortable and relaxed. We loved all that Hawkesbury offered; beautiful home, gardens plus swimming, tennis, bikes, BBQ and the wonderful quiet rural / vineyard surrounds. Marlborough is a wonderful location to holiday in; the endless vineyard vista's or the waterways of the Marlborough Sounds. Hawkesbury Homestead location is perfect to enjoy it all. And if that is not enough and you are lucky enough to stay here, don't forget to step outside and night and take in the night sky - outstanding. A special place; loved it.